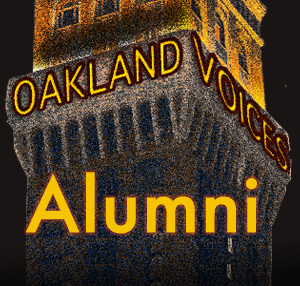 Betty Olson-Jones is back in the classroom after two terms as the president of the Oakland Education Association. As Betty was approaching the end of her second term as OEA president, she had the choice of retiring or going back to teaching. Now she heads a fifth grade class at Sequoia Elementary School, as she had been before.? “I could have retired,” she said. “But I got involved in Social Emotional Learning. I want to help prepare kids to be thinking members of a democratic society.”? 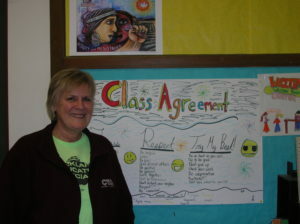 On the whiteboard behind her, I see the next day’s class agenda, which includes a check-in at the beginning of the day – a chance for students to talk about their feelings and ideas, before they get into math, science, reading and other topics. As OEA president, Betty set a more positive tone at the monthly site rep council and increasing attendance. She said she worked hard toward eliminating the screaming and fighting and air of incivility that had characterized meetings in the past. Betty also worked towards building relationships throughout the city, including the mayor, council members, and churches. Betty was instrumental in establishing the Effective Teacher Task Force – a group of teachers, administrators and others who meet regularly to consider the challenges of effective teaching and how to best evaluate teachers. She also helped launch the Teachers’ Convention, an annual showcase of best teaching practices presented by district teachers.?? Among her biggest disappointments during her tenure as OEA president was the failure to settle the contract which expired in June 2008 (and which is still under negotiation). She cited many factors in the ongoing difficulties in settling a new contract, including the state budget and the recession, resulting in massive cuts to early childhood and cutting adult education as well as difficulty around the topic of how teachers should be evaluated.